Ms. Omar said during a speech to the Council on American-Islamic Relations Wednesday that the organization was founded to address Muslims being treated as “second-class” citizens post-9/11. “CAIR was founded after 9/11, because they recognized that some people did something and that all of us were starting to lose access to our civil liberties,” she said. Ms. Tlaib, a fellow Muslim congresswoman with Ms. Omar, blasted the cover for taking her comments out of context and shamed the owner of the paper. “The NY Post knows exactly what it’s doing – taking quotes out of context and evoking painful imagery to spread hate and endangering the life of Rep. Omar. Shame on them, and shame on Rupert Murdoch,” the Michigan Democrat tweeted. Rep. Ayanna Pressley, Massachusetts Democrat, echoed Ms. Tlaib’s comments, tweeting that the cover reckless and said it endangered people’s lives. “[Ms. Omar‘s] full comments clearly speak to post 9/11 [Islamophobia] Manipulating her remarks is defaming & dangerous for her & her family. Stop with this recklessness. [Mr. Murdoch] this is on you – stoking hate, fear & division, putting REAL lives at risk. Shame on you,” Ms. Pressley said. Ms. Omar slammed another one of Mr. Murdoch’s properties, Fox News, for questioning her loyalty to the country during an interview. He later tweeted a clarification, saying he “didn’t intend” to question her citizenship. Tlaib is the poster child for the low IQ bar for Dems elected to Congress. If Tlaib, Omar and AOC added their respective IQs together, there is doubt it would require two digits. You can not serve two masters. Her master is Allah. She needs to go !! And for those who Worship Allah, as per his commandments, you NEVER can have another master. IMO: These two women, plus their watchdog AOC are dangerous and yes, stupid. 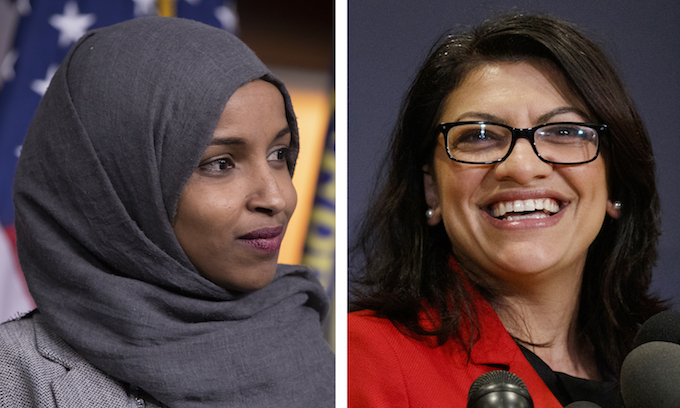 They want to play victim while still using their first amendment rights to spread their own anti-American and certainly anti-Jew/Israel hate while pleading for others to stop using theirs because well, they are saying hateful things that might get these three harmed. Well, look in the mirror!!! While they play the victim of their own making, their self-appointed watch dog attacks, spews her own twisted and tragically uninformed hate that always blames Republicans, Conservatives, racists, Right-wingers, etc….the list of blame is pretty long, though no where do I see their three names. Typical. All three of them are racist and anti-American. I read their tweets – they say things that could get others killed, but hey, that’s okay with them because they are sweet and innocent and everyone is being mean to them. If Nancy P. truly worked for all the People as she keeps stuttering into whatever camera is pointed her way, she would do something about these three. They are going to be the cause of great strife, which is their goal in my opinion. The Palestinians were celebrating and cheering on 9/11. We will never forget. IIRC i also saw those celebration fests in several other mudslime countries.. I bet these women were some of the “someones” that were out in the streets celebrating when 9-11 happened. They all need to be sent to a dark corner where no one has to see them or hear them!